The irony about the Sierra Nevada is that the things that most people worry about really aren’t much of a problem. And the things that really can create life-threatening situations are pretty much off the radar for most hikers. In all of our years in the Sierra, we’ve never seen anyone get bitten by a snake or attacked by a bear. But we have seen people in varying stages of hypothermia and dehydration. And we’ve seen other people who were well on their way to problems in that regard. So what is the single biggest danger in the Sierra Nevada for hikers? We used to think it was hypothermia, followed by dehydration and getting lost. Every year we read about hikers who decided that the warning signs don't apply to them, and enter a raging river. And every year a few of these people get swept away over waterfalls or into rapids. They die. Don't let this happen to you. Believe it when the rangers tell you the rivers are deadly. 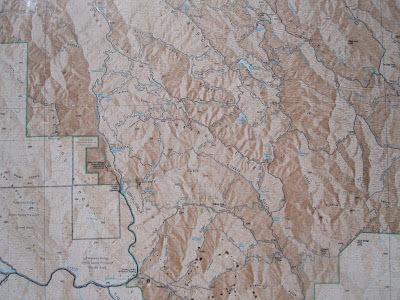 In 2011 we cut short a hike because we came to a river that was perfectly crossable. There was a substantial log across it, and we knew we could probably hike across that log without falling in. But it was a good 40 feet long, and the river underneath it (Mono Creek, in the photo at right) was a raging torrent of white water. So we decided to chicken out. And we are here to tell the tale. A single slip in the water can send you tumbling downstream. And if you bang your head on a rock, you won't be getting out. Which is NOT a nice gift to your hiking partners. Be smart out there, and remember that you only get one chance to make a really stupid mistake. Simply put, hypothermia is when your body can no longer maintain that perfect 98.6 degree temperature, and starts to cool down. That is a bad thing—because when your body starts to feel as if it can’t keep you warm, it tends to focus on keeping your vital organs warm: your torso. And that means less blood to your arms, legs, and head. Your head is where your brain is…and less blood there tends to make to you tired, sleepy, and a little stupid. When that happens, the most logical solutions to the problem may not appear so logical to you---and you start making mistakes that only make things worse. The obvious solution is to get warm. The even more obvious solution is to not get cold at all. That means paying attention to the weather reports, understanding how hypothermia can happen, and bringing along enough clothes to make sure that you are prepared for any situation. Getting wet makes hypothermia much more likely, because the moisture saps your body of heat really fast. How likely is that? We have seen rain during every month of the year in the Sierra, and above 10,000 feet, that rain can become snow without a second thought. So yes, be prepared for rain and snow, even if the weather looks perfect. Even on a day hike. Waterproof outer layers should be in your pack. Fleece inner layers should be on your body, or available. And if you are staying overnight, shelter should be an option wherever you are. When the weather turns cold and wet (and this can happen in fifteen minutes in the mountains) don’t plod on until you really start to feel cold, or until you are ready to make camp. That’s a sure way to get stupid, and then the rest of your decisions will be questionable. Immediately put on your rain gear, and look for places to set up your shelter. Don’t get cold and then try to get warm---stay warm and make smart choices. Warm and sheltered, your mind and body can survive for many days. Cold and stupid, your chances go way down quickly. Our rule? If you start to think about hypothermia, that’s the time to do something about it. Don’t wait until you are sure, because you won’t be able to trust your mind to make a good decision by then. In the High Sierra, the air is so dry and thin that you really don’t notice how much sweat is evaporating off your skin. It is gone before you notice it. (If you are wearing a pack, the back of your shirt may well be soaked—but the rest of your body will be dry. Pay attention to your shirt, not the rest of your body.) Because keeping your body hydrated is really important. On the one hand, your body can survive for two to three weeks without food, but it can only survive a few days without water. But there is an even worse danger with dehydration: it can also create a real imbalance in your electrolytes, and that makes your brain do all sorts of unexpected things, from headaches and hallucinations to just plain stupid. There’s that stupid problem again. We have a simple rule about dehydration, too. If you don’t have to pee every couple of hours, you are probably getting dehydrated. Stop, drink all the water you have, and then make a plan for how you are going to proceed. You never get any prizes for arriving at a water source or a campsite with lots of water in your bottles. You often get punished for making dumb mistakes because you are dehydrated. And if you see your partner looking hot and tired, stop for a rest and a drink! If you have done much hiking, you have seen dehydrated hikers. They are plodding along, mouth open, gasping. They may even tell you that they are not dehydrated, because they are not even sweating. If you are not sweating during a hike, it’s because you are so dehydrated that your body can no longer produce perspiration. And it’s a function of that dehydration that your brain thinks that this is a good thing. Stupid. People who are dehydrated make dumb mistakes, like passing up a water source to make better time to the next one, or missing a trail junction because they aren’t paying attention. And then they get more dehydrated. And they make more stupid decisions. Again, the solution is preparation. Drink plenty of water before you hit the trail. Take plenty of water on the trail. Plan your trip so that you are sure where you can get water, and fill up. Drink until you have to pee, all during the day. And make sure that your pee is clear, not dark yellow. If you think you are getting dehydrated, drink and rest until you know you are not. If you think you are not dehydrated, that isn’t good enough! It is actually pretty hard to get lost in most of the entry level hiking areas of the Sierra Nevada. The trails are well marked, and there are enough people on them to ask a question or two if you are feeling a little confused. When you add those facts to the great USGS website that allows you to get free topographical maps every hike, there is really very little excuse for getting lost in the Sierra. Except that people do it all the time. We’ve met people in the Sierra who were literally FIFTEEN TRAIL MILES from where they thought they were, and it had only, in the previous ten minutes, occurred to them that something might be wrong. It was after 3 p.m., and they had one bottle of water between the two of them, no warm clothes, and about 9 miles to hike before nightfall. As with the previous two dangers, the first solution is to be prepared, and not get lost at all. You should always have a compass and map, and know how to use them. GPS units are great, but they can sometimes lead you to within 500 yards of your rescue: the problem being that those 500 yards can be straight up or down a cliff. And when you are dehydrated or hypothermic, you think maybe that it wouldn’t be too hard to climb down that cliff. After all, it’s only 500 yards! Ahem. Don’t get lost. Use a map, and track your progress on the map. (GPS units are great for this as well.) Look for landmarks as you go along. If you don’t find them, little alarm bells should start ringing in your head. When you do find them, confirm them on the map, so you know where you are. It often helps to do these calculations with everyone in your group—just to make sure that your navigator isn’t a little confused. If you do get lost, don’t panic. The best thing you can do when you are lost is to sit down, have a nice snack, drink a lot of water, make sure you are warm, and think. Go back to that map and find where you were the last time you were sure you were on the trail. And then look for solutions. If you are on a trail, DO NOT LEAVE THAT TRAIL! Sometimes it’s just a question of being tired, and having slowed down. Another ½ mile and your destination will appear. Sometimes you have taken a wrong turn. Sometimes the trail is poorly marked, and you’ve lost it. Sit down and think. It is ALWAYS better to wait for someone to come along than it is to start running. Whatever you do, don’t start running up and down the mountains in a panic. If you do that, you will not drink enough water. You may get hypothermic. And you will almost certainly make some really bad decisions. With luck, you will get found before you do something stupid. But every year someone gets lost in the Sierra, and doesn’t get found until they have died. Don’t get lost. And if you hope to get found, you should always tell someone where you are going and when you are expected back. Tell them what they should do if you are not back in time. And staying on the trail will absolutely help the Search and Rescue team find you. Deciding to go off-trail means you have to be a LOT more careful--because you will be a lot harder to find. Hiking alone? Then stick to these rules even more religiously. Statistically, this is your best bet for an accidental death in Yosemite. Most people really underestimate the power and force of a rushing river, and the smooth, glaciated granite in Yosemite doesn't give you a chance to second guess your decisions. A slip, you bang your head on a rock, and you become another statistic. And in a snowy year, when the spring runoff is at its peak, crossing even a smaller stream can be like walking through a hundred fire hoses. There's reason that they use fire hoses to break up protests: the force they pack is overwhelming. So is the force of a creek in full spring runoff flood. But this is so easily avoided. Be smart. Don't enter a stream unless you have a VERY good reason to believe that it can be forded easily. Look upstream and down for a good log to use for a crossing. If you have to ford a stream, use a stout stick or hiking pole on the downstream side to support yourself and give yourself one extra chance to recover from a slip. Aim for a shallower, wider part of the stream, where the current will be less strong. And walk slowly down and across, rather than straight across. Remember that the water in the Sierra is amazingly clear. It's much deeper than it looks! And almost all the streams in the Sierra will run higher in the afternoon than in the morning. So if you come to a steam that is too high...there is nothing that says you can't set up camp and wait to see how it looks in the morning. Most of all, be careful, and don't give in to the temptation to say: we have to get to the other side of the creek. Because you don't. We have done all of the above, including hiking about mile cross country in the snow, so that we could pick up the trail when it came back on our side of the creek, which was lots safer than fording the roaring steam. And we have turned back because we knew we didn't have to cross that creek. We're still here to tell the tale. No, this doesn't mean that you should try to air condition your tent. But at 10,000 feet, your body is getting a lot less oxygen than it does at sea level, and that has some real repercussions. While altitude sickness won't generally kill you at the kinds of elevations we see in the Sierra, (the Himalayas are another question!) it can make you really unhappy. And that's no fun for you or your companions. What are the symptoms? Similar to de-hydration, you can first notice a headache, and general weakness. You often lose your appetite, and this can lead to full-blown nausea and vomiting. And a worse headache. Some of these can also be traced to de-hydration, which is another reason to stay hydrated. The solution is to acclimatize slowly. M swears that she always does better when she spends a night at 3000-5000 feet before we head up into the high country. And she does much worse if we just drive up and start hiking. The worst case we ever had was a day when we drove up from sea level, set up camp, and then climbed Mt Hoffman, which is over 10,000 feet. M felt awful, and continued to feel awful even after going to bed early. She woke up in the middle of the night and vomited numerous times, entertaining the neighbors in the campground. The next morning she felt pretty good, and for the next four days we hiked at altitude without any real problems. So take it easy. If you feel bad, stop, rest, and even head back downhill. Ah! This is the stuff that everybody wants to talk about. Wild bears who attack campers in the middle of dinner. Ferocious pumas who lie in wait behind every tree. Snakes that crawl into your sleeping bag at night! Axe murderers! Sorry. Doesn’t happen. Since 1980 there have been a total of twelve reported attacks by black bears in California. That’s an average of less than one attack every three years. Most occurred in developed campgrounds or rural urban interfaces, not in the wilderness. None were fatal. In that same time period, there have been about the same number of reported puma attacks—most near the rural urban interface, and none in wilderness areas. Almost all involved children or small adults. Roughly 800 people this year will be bitten by rattlesnakes, and one or two of those bites will result in death. Most of those bitten are young men who are bitten on their hands or arms. Enough said. So you are not going to get killed or eaten by wild animals. 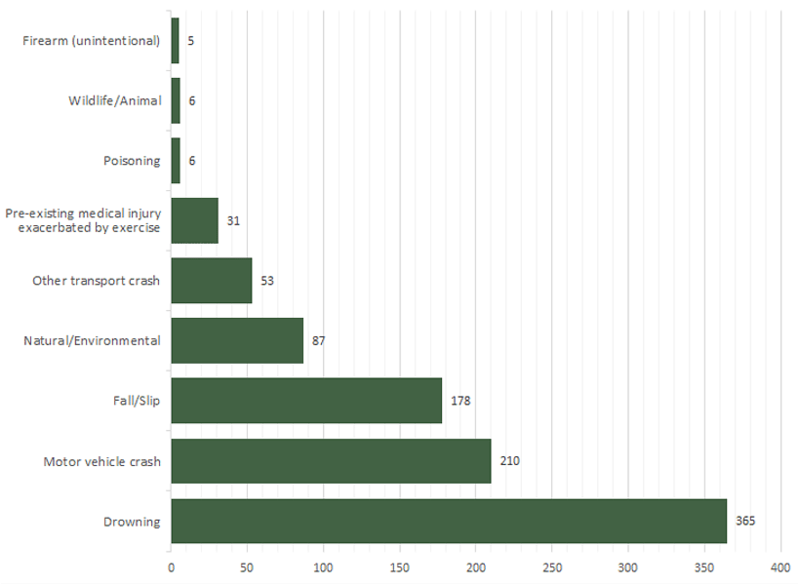 In contrast, some 370,000 Americans are bitten by dogs badly enough to need treatment at the emergency room, and nearly 4,000 people will die in traffic accidents in California this year. And about 30,000 people will die from gunshots of one kind or another in the US. If you want to be safe, get out of the city, get out backpacking in the High Sierra and STOP DRIVING YOUR CAR! Actually, the only death attributed to a wild animal in the history of Yosemite National Park was a young boy who was killed by a deer. The boy was attempting to protect a back of chips that the deer had found, and the deer defensively gored him in the chest, slicing open an artery. Again, we have a few solutions. When you are in the wilderness, understand that you are in wild country. Pay attention. Bears are attracted by odors of food, so limit the food smells you create. (See the bear in the photo at right? That's the only one of only three bears that we've seen in the backcountry. Zoom in. He's there.) Store your food in bearproof containers to keep them from getting used to the idea that hikers mean food. Most developed campgrounds in our parks these days provide steel bear boxes for your food, and since those have been installed, bear damage to vehicles and camping equipment has drastically declined. Pumas generally attack small people who are alone. They attack from behind. If you see a puma, stand up tall and face it. Fight back. Scream for help from nearby hikers. Write about it later, and make lots of money from the TV movie. Rattlesnakes generally try to avoid people, and often will start to take defensive action when they feel your footsteps approach. Leave them alone. Don’t put your hand where you can’t see, and don’t climb cliffs blindly. Want some really interesting statistics? 130 Americans are killed by deer every year. 65 are struck by lightning. 100 are killed by bees. 20 are killed by cows. The most dangerous animal in Yosemite is the horse---at least more people have died from injuries causes by horses than by all other animals combined. Makes you wonder, huh? Worried about fellow hikers? Your chances of being a victim of violent crime in America are 1 in 50. In the national parks, it's 1 in 700,000. Most importantly, drive very carefully to the trailhead. Your chances of dying are 4,000 times higher on the highway than they are on the trail.